I’m glad I stayed until the end of Money2020. Some time after 5pm on day four (9 Oct 2013) of the biggest financial tradeshow since BAI Retail Delivery in Nov 2000 (see note 1), Josh Reich introduced two members of team Simple, Tom Wanielista and Collin Ruffenach. The duo proceeded to send each other the first Bluetooth-enabled payment I’ve ever seen. It looked a lot like a Bump payment, recently relaunched by Capital One 360, but without the awkward phone gyrations. 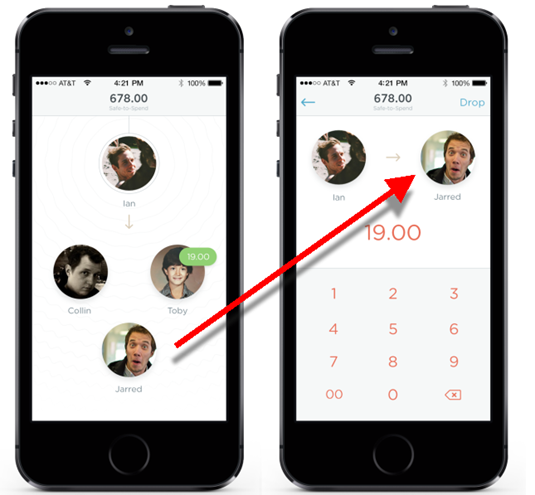 The feature is called MoneyDrop, built by Wanielista and Ruffenach, and allows Simple users within a few feet of each other to transfer money with a few finger swipes in the Simple mobile app. It’s easy to use, since other Simple users automatically pop up on the MoneyDrop screen when they are in range (see screenshot below). The startup didn’t say when the service will be available to Simple’s 65,000 customers, but TechCrunch reports it will hit iOS first (iPhone 4S or above required) with Android in the pipeline. 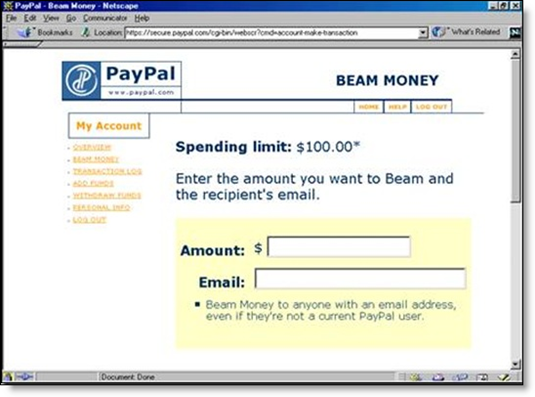 Bottom line: MoneyDrop is similar to the Palm Pilot “beaming” service PayPal began in 1999, but then quickly abandoned for email p2p model (see note 1). The ubiquity of smartphones makes it much more interesting today. Still, the requirement that both users have a Simple account, and newer smartphones, limits its uptake for now (note 2). While I didn’t know it at the time of the Money2020 session, Square was about to introduce a drop-dead simple P2P payment system (see Friday’s post). That’s a free and easy way for Simple customers to move money as well. It took just 3.5 hours in my test for money to move from my Chase debit card to my Simple account. Not as cool as instant MoneyDropping, but it works with any Visa/MasterCard debit. Despite all that, I think it’s a great move by Simple. MoneyDrop provides a tangible leg up on other mobile banking apps, a moderate viral boost, and great publicity. 1. Retail Delivery topped out around 10,000 attendees (includes exhibitor staff) in 1999/2000. After just two years, Money2020 is at more than 40% of that. 2. A TechCrunch commenter noted that MoneyDrop also sounds like what stealthy Clinkle is planning to unleash on the world. Quite a coup if Simple beat them to market. 3. For more info on peer-to-peer payments (P2P), see our Online Banking Report issue devoted to the topic (Dec 2009, subscription). It’s been six months since we handed out an OBR Best of the Web award (archives; see note 1). Since then, many new enabling technologies and promising applications were launched. But with every passing year, it gets harder to raise the bar with a new digital financial product. But Square did it this week. The company took P2P payments — which PayPal commercialized in 1999 (see last screenshot below) and CashEdge/Fiserv bankified in 2009/2010, and which Google simplified in May — and distilled the payment scheme to its essence. Just email money directly (via debit card) from any client, web, mobile, tablet or any other email-enabled device (or from the Square mobile app). No third-party accounts needed, no login, no challenge questions, no selecting your payment method, no navigating various fee structures. Just send payment like you would any other email by adding a cc to Square. And amazingly, neither the sender nor recipient need be preregistered with Square. All it takes to send or receive small amounts ($250/week) is a U.S. based MasterCard or Visa debit card number, expiration date and ZIP code (see third screenshot; note 3). And once you’ve entered that the first time, you can literally send a P2P payment in two or three seconds (assuming you were already in your email client). It’s hard to imagine P2P payments being any simpler. And Square is doing it all for free. The biggest hurdle, as Walt Mossberg pointed out in the Wall Street Journal, is trust. The system is so easy to use, that it almost doesn’t seem possible. The other limitation is that users can register only one debit card per email address. There is no way currently to substitute a different card. Since this is Square (fintech’s Apple), the design is gorgeous and the user experience is outstanding (Jim Marous breaks it down here). But the pundits are scratching their heads a bit about why the company launched a service with negative margins (note 4) that isn’t solving any major consumer headache and is disconnected with its consumer wallet and Square Register-acquiring business. I think they are doing it to get millions of debit cards registered with their service. Then when new customers show up at a Square merchant, the company will try to switch what would have been a credit card transactions over to debit. This could potentially save gazillions in interchange, especially when debit price controls are expected to lower the interchange into sub 10-cent-per-transaction territory. But how they accomplish this integration is still a mystery. The company is so far silent on the end-game for Square Cash. Since Square is paying interchange to debit card issuers, financial institutions should be neutral about this service (note 3). Sure it takes P2P payments out of your control, but if your debit card is linked to the service, it increases usage. For those with a fee-based P2P offering such as POPmoney, Square Cash is a competitor, but with its transaction limits and other consumer uncertainties, it’s not on equal footing and initially shouldn’t be a huge threat. In fact, banks and credit unions might consider integrating Square Cash directly into online/mobile banking. A script could write the payment email and send it directly from online/mobile banking. 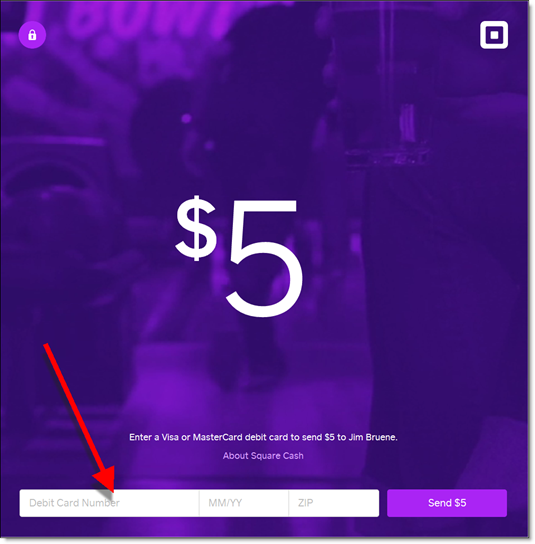 The primary drawback would be the confusing email confirmations from Square and the initial debit card signup on the Square page (screenshot #3), so it would take some customer education. But once customers got through that, it could be a minor profit center (see caveat, note 4). Note: A message in the body is optional. It can just as easily be left blank. 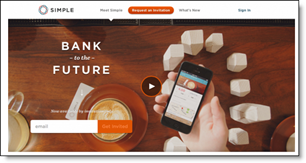 to companies that pioneer new online- or mobile-banking features. It is not an endorsement of the company or product, just recognition for what we believe is an important industry development. In total, 90 companies have won the award. This is the first for Square. Recent winners are profiled in the Netbanker archives. 2. In a Quora post, Brian Roemmele estimates Square pays between $0.10 to $0.25 per transaction to MasterCard or Visa and Chase, its acquiring bank (and Square investor). 3. Recipients can also deposit directly into a bank account if they don’t have a debit card. 4. It should be a net positive to the bottom line, unless there are unintended consequences, such as customer support or increased fraud. 5. For more info on peer-to-peer payments (P2P), see our Online Banking Report issue devoted to the topic (Dec 2009, subscription). 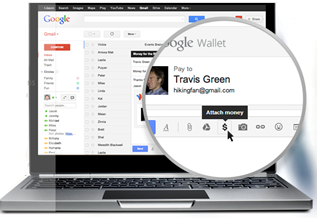 As you probably already know, last week Google launched P2P payments via Gmail (and through the Google Wallet mobile/online interface). 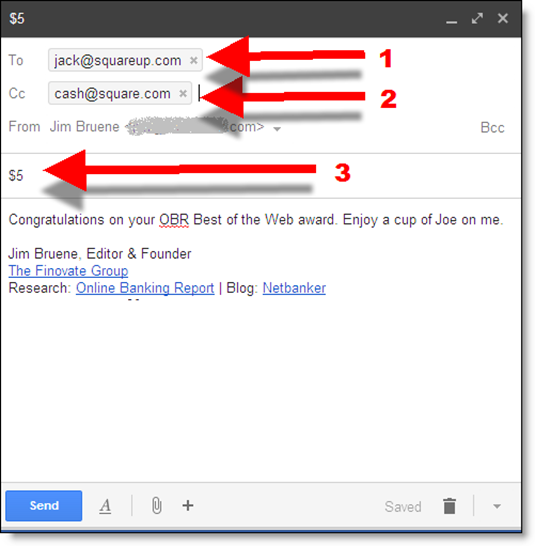 Once authenticated, users simply “attach” funds to an email message (see inset). Bank transfers (e.g., ACH) are free while card-based payments will cost senders 2.9% of the amount, with a $0.30 minimum. 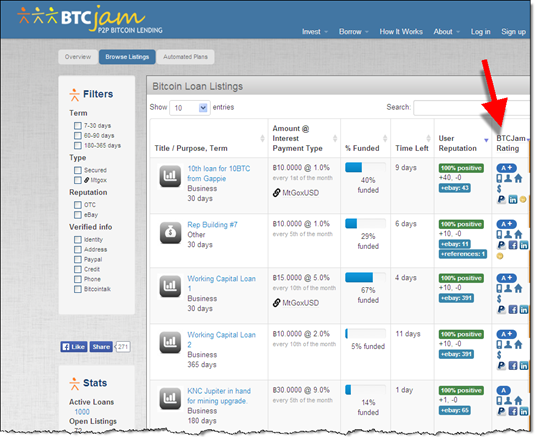 However, all transactions are free for an unspecified time during the launch period. With an estimated 400 to 500 million global Gmail users, the service has the potential to become an important method of sending money (it’s only available to U.S. users at this point). 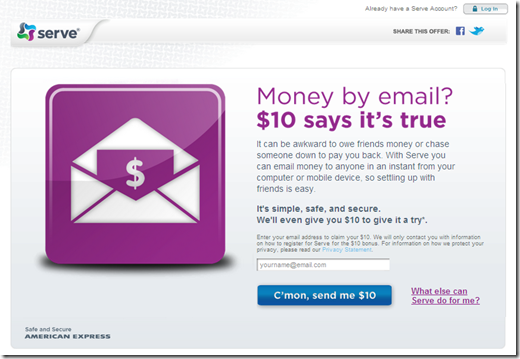 However, like all U.S.-based P2P services, it’s easy to send money, but not always so easy to receive it. 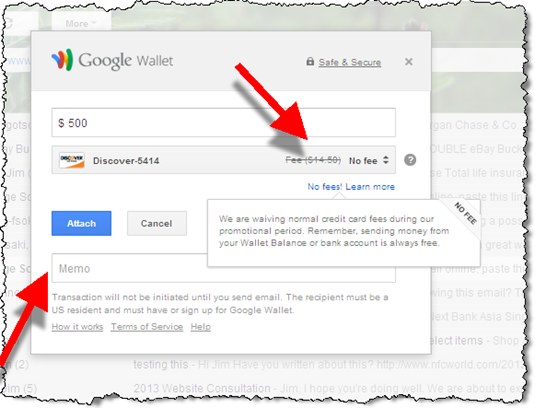 In my first test, I was able to claim the funds relatively easily with my four-year-old Google Wallet account. There was a short authentication process with a login, name, address, birth date and last four digits of my Social Security Number (SSN). After claiming the funds, I was then able to send money out of the system (note 2). After sending my two cents over to Larry Page, congratulating him on the launch (see screenshots below), I then sent money to my work email account. 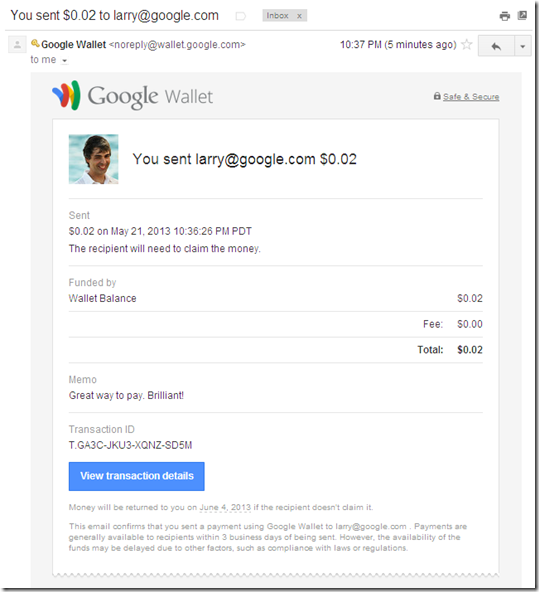 While it was deceptively simple to send the money, I was unable to claim the money, despite already having an active Google Wallet associated with that email address. After receiving the email notification, I went through the same authentication process as above. But after logging in and providing my personal info, I was hit with four additional out-of-wallet authentication questions, apparently pulled from public databases (I think NOT my credit bureau due to the errors..see below). But apparently there was an error in the out-of-wallet Q&A served to me. The first two questions obviously pertained to me, and I answered them correctly, but the final two did not (note 6), so I answered “none of the above.” But Google didn’t believe me, and I was told my answers were “inconsistent” and that I could not be authenticated online. Unfortunately, I haven’t laid eyes on my Social Security card for several decades and haven’t a clue where it is. And in 18 years of testing online account opening, no one has ever asked for it. So I’m stuck. Had someone sent me a real payment, I would be extremely frustrated, and would have to either ask for a check to be sent, or use PayPal. Bottom line: This is a brilliant play by Google, taking everyone by surprise. However, P2P payments (in the USA anyway) are still a pain to receive the first time which dampens their viral growth (note 7). 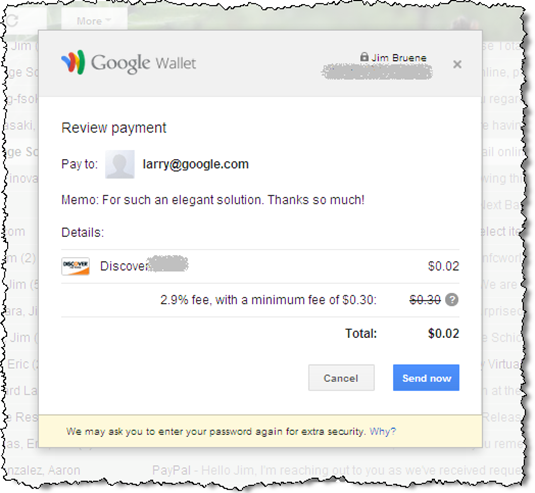 I understand the reasons for good authentication, though it still seems like overkill given that I was only claiming a one-cent transfer via a pre-existing and active Google Wallet account (used for more than $400 worth of purchases this year). And especially after I provided the correct name, address, birth date, SSN and two additional out-of-wallet questions. But I know the folks from Mountain View, Calif., will work the risk-procedure kinks out quickly (there is a reason it’s called “beta”). And if they stick with it (RIP Google Reader), Google should be able to build a critical mass of financially authenticated users, making “gpay” as easy as using PayPal. 1. 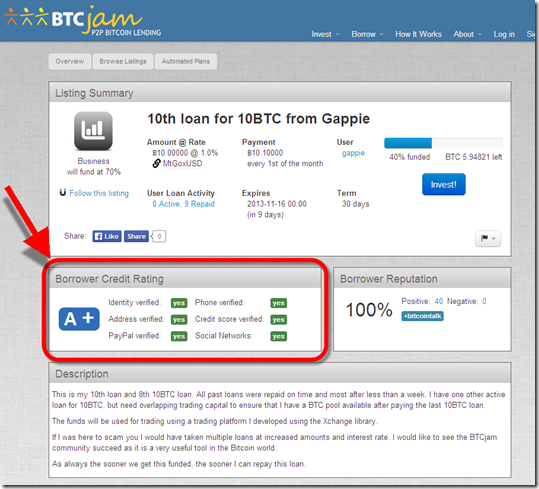 During the beta test, you can become a P2P user only by first receiving funds from an existing user. 2. I have two Google Wallet accounts, one set up in 2009 and the other established in January 2013 when I got a Nexus NFC phone with built-in Wallet support. The credit card associated with both accounts was stolen earlier this year, and I had to add a new card to both wallets before I could use them. This could have triggered additional authentication requirements on the second Wallet account. 3. 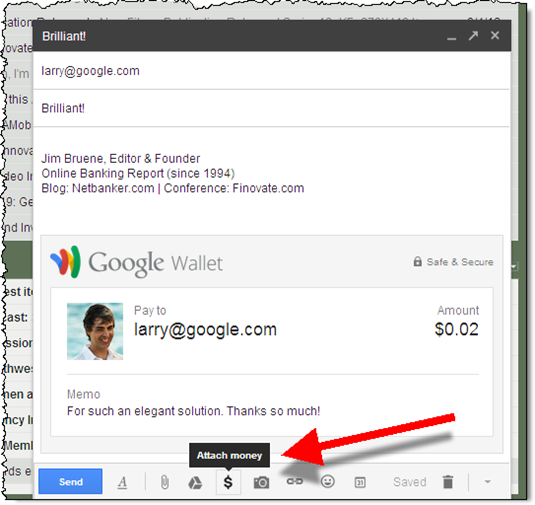 The payment appears as a “card” within a Gmail. 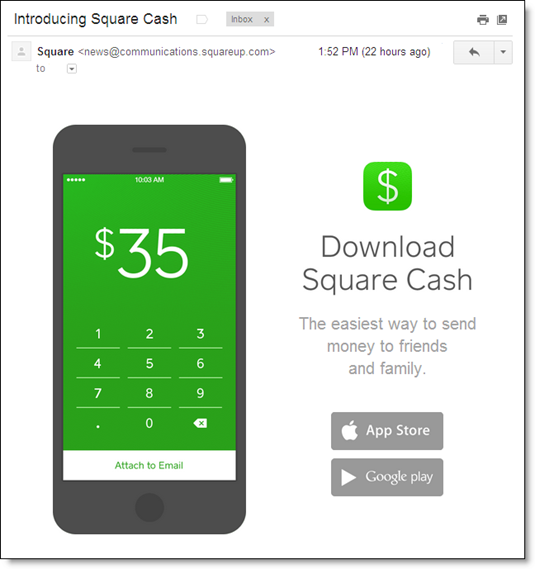 There is no indication in the title of the message that it might contain money (user controls the rest of the email). 4. The transaction fee was waived for my Discover Card-based payment. I assume it would be on other card types, but I didn’t test that. 5. 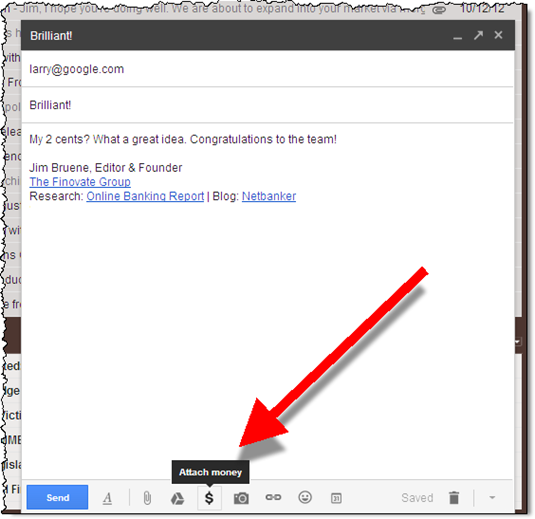 Users have the option to add a memo to the payment (in addition to what’s included in the email message). uploaded directly into their account (see post). 7. Though I suspect the last two questions could have been drawn from online info about my brother, who has a different first name and lives 2,000 miles from me. 8. Yesterday, confirmation emails went to my inbox when I sent a payment. Tonight, I am not seeing that: It’s only showing in my Sent messages. 9. For more info, see our recent Online Banking Report: Digital & Mobile Wallets (published Feb 2013, subscription). Startups are advised to find pain-points, then build businesses to profitably solve them. Despite the current wave of very bad publicity around banks, especially the big ones, everyday banking isn’t a huge pain-point for the 80% of households currently served by existing players. Sure, I’d like to have more security options, fewer unintelligible messages, and a Cash Tank. But most of these are feature/function improvements, not “must-have” issues that need to be solved. What are the acute pain points in banking and personal finance? Three of these five have to do with the debt side of the consumer’s balance sheet. Yet, much of the talk about online/mobile banking innovations centers around spending management, payments, checking and savings accounts, and account access technology. It’s a truly free, full-featured checking account, with debit card, paper checks and all the usual (but no branches, of course). And it’s powered by The Bancorp Bank, which has its hands in many of the new direct banking initiates we are seeing, including (bank) Simple. But the special sauce is a built-in rewards program tied directly into student loan payback. It’s actually two separate accounts, rewards and checking. You don’t need to buy the checking account to participate in the rewards program. 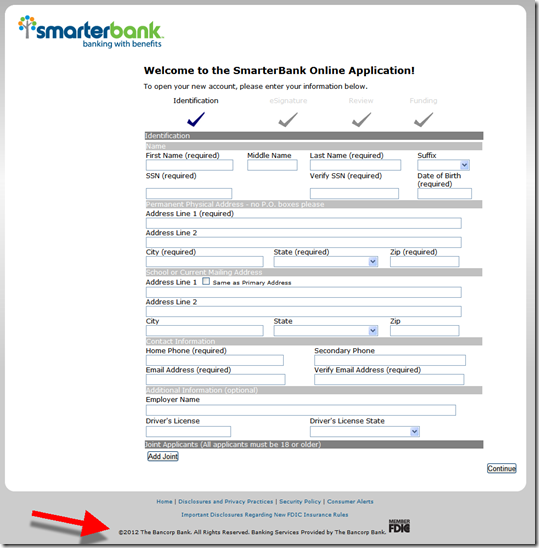 But you must be in the rewards program before you can get a SmarterBank checking account. Marrying rewards, checking/debit, P2P family contributions, and student loan repayment is brilliant. It not only provides a tangible benefit for the 37 million Americans with student loan debt (see note 1), but also is a great customer-acquisition tool for a very important segment, recent college grads. Financial institutions looking for more twenty-something customers should consider building similar capabilities or partnering with SimpleTuition. 1. Figures are from the company. It also said that 10 million students owe more than $50,000, and 2 million owe more than $100,000. 2. 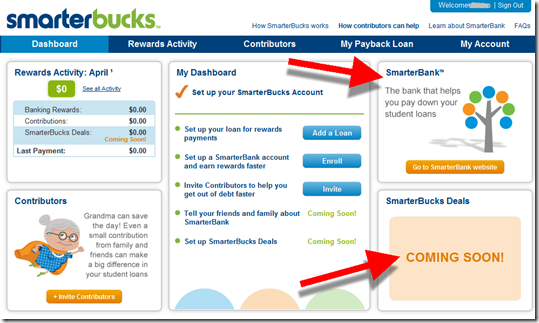 Friends and family will also be able to link their own SmarterBucks account to the student’s. 3. We covered family/student banking nine months ago in our Online Banking Report (here). Guess What I’ve Been Researching Online? I realize that ads based on recent activity are effective. But it’s still slightly unnerving, wondering whether you’ve lost every last bit of privacy or that you’ve been hit by an adware virus. But overall, it’s good to get relevant offers, especially when one has a $10 bonus in it (see AmEx below). 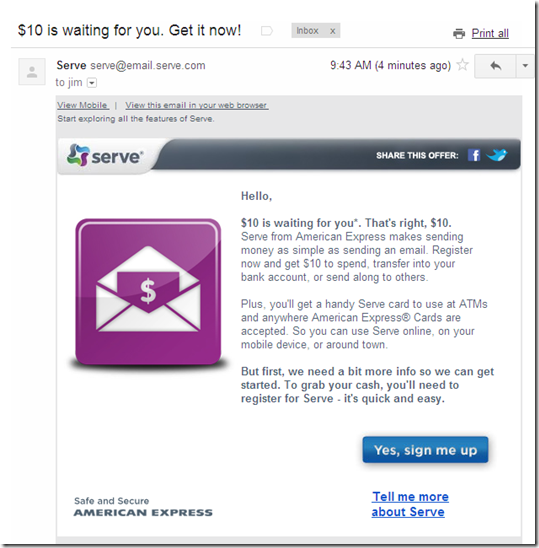 I wrote a blog post on Serve yesterday (see AmEx promo on top of the page) and have been banging around insurance sites (see Geico ad on right) for the past two weeks as I wrap up a report on the subject. After entering your email address, the button turns to a thank-you. It’s good feedback for the user and keeps them from accidentally submitting the form twice. 2. We covered P2P payments two years ago in our Online Banking Report (subscription). It’s a problem as old as money itself. The person making a purchase on behalf of a group inevitably gets stuck with a larger share as others “forget” to pay him/her back (note 1). Two weeks ago, American Express launched a clever product tie-in on TicketMaster to help change that. 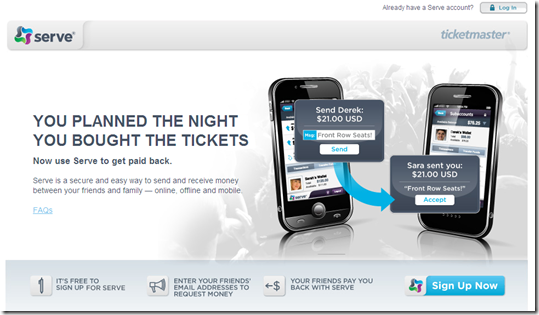 After making a purchase, a prominently placed box suggests using Serve to “Get Paid Back.” Buyers are encouraged to use Serve to send money requests to friends for their share of the tickets. 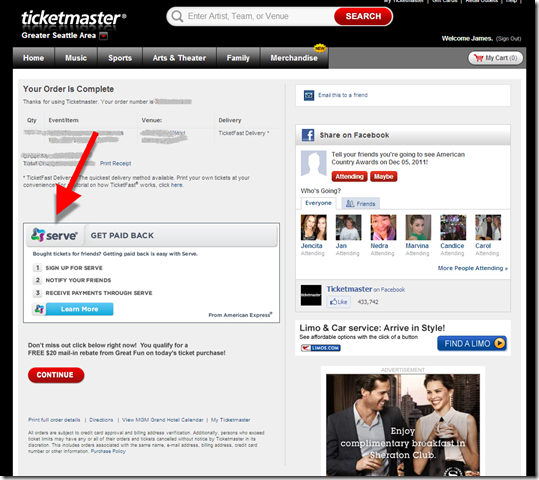 Given how social ticket purchasing is, it’s a great place to introduce P2P. But there’s still the not-so-small problem of getting everyone signed up. Both sender and recipient must have Serve accounts. And while all transaction are currently free, the FAQs warn that coming Jan 1, there will be a fee of 2.9% + $0.30 per transaction funded via credit card. Checking account (ACH)-based transactions will remain free. 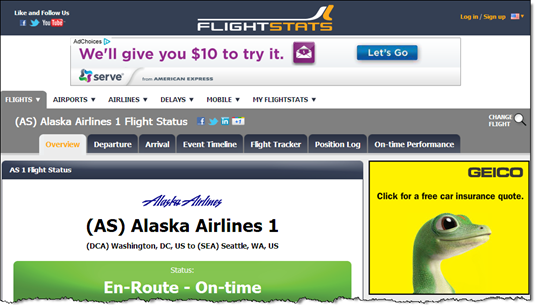 To beat PayPal at this game, the service needs more than just well-placed ads. For example, integration directly into the Ticketmaster shopping cart, where buyers could enter friends’ email addresses to automatically “charge” them their share (subject to their approval of course). Note: We covered P2P payments two years ago in our Online Banking Report (subscription). During an an onstage interview at The Wall Street Journal’s AsiaD conference, Jack Dorsey said he was working with banks to distribute Square readers/accounts directly to bank customers. Since it was Honk Kong, I was thinking OCBC or HSBC. But it turns out the first financial institution (note 1) to take Jack up on his offer, is WV United FCU, a 5,000-member CU headquartered in Charleston, West Virginia. If that name sounds familiar, it’s because it was the first financial institution in the world to implement mobile remote check deposit in August 2009 (previous post). 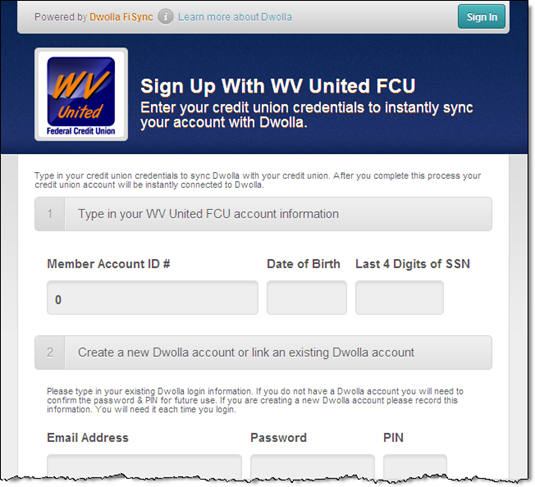 WV United is also featuring Dwolla P2P/alt-payments on its homepage. Square: The CU is promoting Square on its home page (see screenshot #1 below). 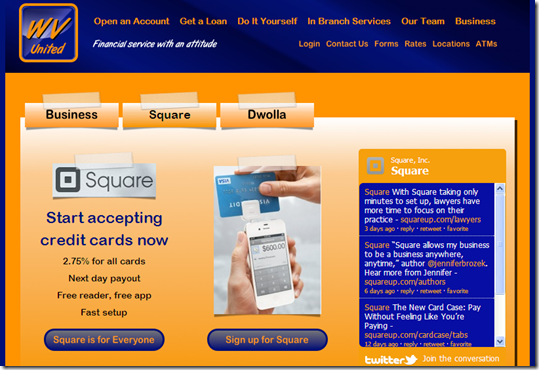 Square is the first of five promotions that rotate across the top (see also Dwolla below). The promotion features the 2.75% merchant rate and uses the @square Twitter feed to make it more interesting. The landing page invites members to signup for Square and redirects them to the startup’s webpage. It doesn’t appear there are any official affiliate arrangements. But Square allows payments to be transferred to any bank account, so WV United members can have the proceeds automatically deposited to the CU account. 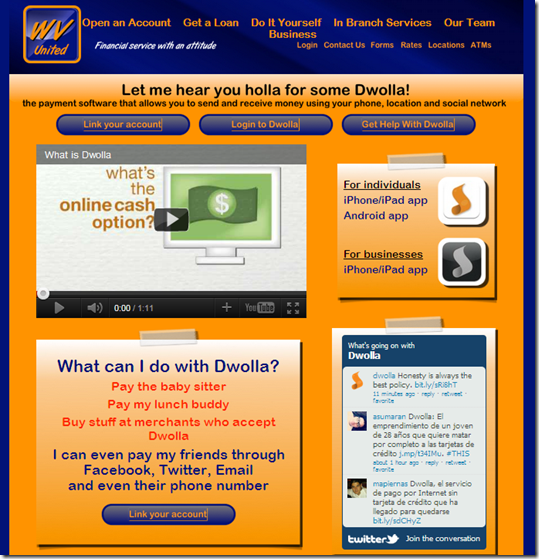 Dwolla: The Dwolla connection is more integrated, with a co-branded online account opening page (screenshot #4). There is also more info loaded onto the CU’s page including a short video, the @dwolla Twitter feed, and a features/benefits section. Bottom line: No one is going to accuse 11-employee WV United FCU of not keeping up, innovation-wise, with the big banks. In fact, it’s setting the pace in some areas, albeit in a more "bolted on" fashion (note 2). Granted there’s little, if any, direct revenue from these efforts. But they also require no infrastructure investment. So, if they keep members satisfied and employees excited, then it’s a win. 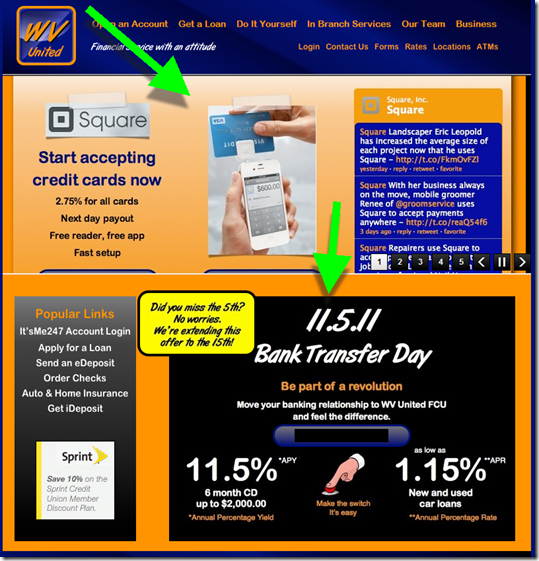 Note: The credit union leveraged Bank Transfer Day for another 10 days (lower right). Smart. 1. They are the first that I’ve heard of. There could be others linking to Square in a similar fashion. 2. When I say "bolted on" I mean that the experience isn’t integrated with other WV United online offerings. Integrated is best, but bolted on is a good way to test the market and keep costs down. 3. For more info on P2P payments and other topics, see our subscription service, Online Banking Report.